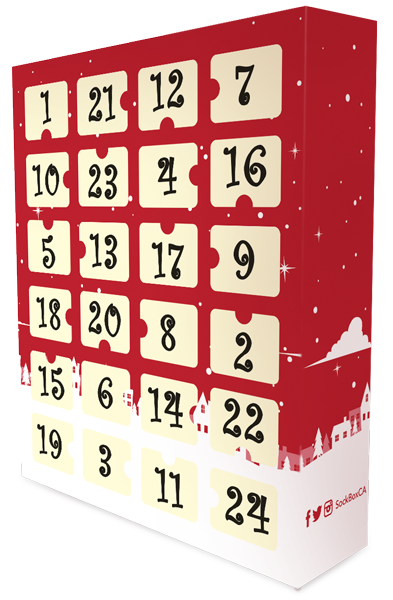 Our first ever women’s edition sold out in September, and our fourth annual Sock Lovers Advent Calendar™ in November! Follow along as we unbox awesomeness each day. #slac18 Day 2! These beauties from @ozonesocks will be perfect for hanging out at the cottage. #ozonesocks #sockslife / / Don't forget to take a photo of your daily sock discovery, share it using the hashtag #slac18 and tag us in the photo for a chance to win a 2019 Sock Lovers Advent Calendar! #slac18 Dec 2 Women’s! Hello @stancesocks! These are probably the most comfortable your feel will feel all day. #sockslife / / Don't forget to take a photo of your daily sock discovery, share it using the hashtag #slac18 and tag us in the photo for a chance to win a 2019 Sock Lovers Advent Calendar! #slac18 Dec 3 Men’s! Get your pink on with these slicks from @BarnabyShop #sockslife / / Don't forget to take a photo or video of your daily sock discovery, share it using the hashtag #slac18 and tag us in the post for a chance to win a 2019 Sock Lovers Advent Calendar! Day 4! There’s just something about ponies and argyle that’s totally doing it for us. Enjoy the beauties from a new supplier @ponyfriday! #sockslife 🐎🎁 / / Don't forget to take a photo of your daily sock discovery, share it using the hashtag #slac18 and tag us in the post for a chance to win a 2019 Sock Lovers Advent Calendar! Day 4 Women’s! Our second new addition in a row! Welcome to @PonyFriday and hello “Cloud 9 Boot socks” (we think you’ll get along just fine). #sockslife 👌🏼🎁 #slac18 / / Don't forget to take a photo or video of your daily sock discovery, share it using the hashtag #slac18 and tag us in the post for a chance to win a 2019 Sock Lovers Advent Calendar! #slac18 Dec 5th Men's! Bamboo socks from @socksmith for those tired feet. Can we get a hell yeah! ?#sockslife / / Don't forget to take a photo of your daily sock discovery, share it using the hashtag #slac18 and tag us in the photo for a chance to win a 2019 Sock Lovers Advent Calendar! Dec 5th Women's! These bamboo crews by @socksmith will sooth your tired feet into a dreamy land of cherry blossoms. #sockslife / / Don't forget to take a photo of your daily sock discovery, share it using the hashtag #slac18 and tag us in the photo for a chance to win a 2019 Sock Lovers Advent Calendar! #slac18 Day 6 Men’s! “Team Netherlands” in little squares on your feet! Thanks @Fresh_set #sockslife / / Don't forget to take a photo of your daily sock discovery, share it using the hashtag #slac18 and tag us in the photo for a chance to win a 2019 Sock Lovers Advent Calendar! #slac18 Dec 6 Women’s! The fine folks at @RicherPoorer have a winner with these beauties. Put them on. You’ll see what we mean. #sockslife / / Don't forget to take a photo of your daily sock discovery, share it using the hashtag #slac18 and tag us in the photo for a chance to win a 2019 Sock Lovers Advent Calendar! #slac18 Day 7 Men’s! These fun threads from @FridaySockCo have the globe on one sock, rockets on the other. Ready for lift off! #sockslife / / Don't forget to take a photo of your daily sock discovery, share it using the hashtag #slac18 and tag us in the photo for a chance to win a 2019 Sock Lovers Advent Calendar! #slac18 Day 8 Men's! Designed in Canada by @GoodLuckSock and are perfect for those tired board meetings. #sockslife / / Don't forget to take a photo of your daily sock discovery, share it using the hashtag #slac18 and tag us in the photo for a chance to win a 2019 Sock Lovers Advent Calendar! #slac18 Day 9! We thought these gnarly herringbone by @wolf_co would fit the bill? Yeah? #sockslife / / Don't forget to take a photo of your daily sock discovery, share it using the hashtag #slac18 and tag us in the photo for a chance to win a 2019 Sock Lovers Advent Calendar! #slac18 Day 10! We take you on a safari with this set from @sockittomeinc … Will be especially noticeable while you’re “lion-around” #sockslife / / Don't forget to take a photo of your daily sock discovery, share it using the hashtag #slac18 and tag us in the photo for a chance to win a 2019 Sock Lovers Advent Calendar! #slac18 Day 11 Men's! A classic argyle mix by @unsimplystitched sure to please your inner countryman. #sockslife / / Don't forget to take a photo of your daily sock discovery, share it using the hashtag #slac18 and tag us in the post for a chance to win a 2019 Sock Lovers Advent Calendar! #slac18 Day 12! Half way to the end. But we’re having so much fun! And the comfort level just went up a notch with these merino wool beauties by @RicherPoorer. Yum. #sockslife / / Don't forget to take a photo of your daily sock discovery, share it using the hashtag #slac18 and tag us in the photo for a chance to win a 2019 Sock Lovers Advent Calendar! #slac18 Day 14! Welcome @dirtysocksink to the stage! A hot addition to this years Advent Calendar don’t you think? #sockslife / / Don't forget to take a photo of your daily sock discovery, share it using the hashtag #slac18 and tag us in the photo for a chance to win a 2019 Sock Lovers Advent Calendar! #slac18 Day 15! The art of socks just got a whole lot more killer with the welcomed addition of @xpooos. Ware these with pride, yo. #sockslife / / Don't forget to take a photo of your daily sock discovery, share it using the hashtag #slac18 and tag us in the photo for a chance to win a 2019 Sock Lovers Advent Calendar! #slac18 Day 16! These @ballonetsocks are another colourful addition to any boring meeting day attire. #sockslife / / Don't forget to take a photo of your daily sock discovery, share it using the hashtag #slac18 and tag us in the photo for a chance to win a 2019 Sock Lovers Advent Calendar! #slac18 Day 18! Don’t hold back with these lovelies from Statement @boldsocksdotcom. #socsklife / / Don't forget to take a photo of your daily sock discovery, share it using the hashtag #slac18 and tag us in the photo for a chance to win a 2019 Sock Lovers Advent Calendar! #slac18 Day 20! Maple leafs and Canadiana for your patriotic footsies. Wear them with pride, fellas. Design by @wwojeff #sockslife / / Don't forget to take a photo of your daily sock discovery, share it using the hashtag #slac18 and tag us in the photo for a chance to win a 2019 Sock Lovers Advent Calendar! #slac18 Day 21! Aquaman fans rejoice. This set from @bioworld is just for you! #sockslife / / Don't forget to take a photo of your daily sock discovery, share it using the hashtag #slac18 and tag us in the photo for a chance to win a 2019 Sock Lovers Advent Calendar! #slac18 Day 22! We swear these mind-benders from Oak and Stone are an optical illusion. See it? No? Ok maybe we’re just loosing it. #sockslife / / Don't forget to take a photo of your daily sock discovery, share it using the hashtag #slac18 and tag us in the photo for a chance to win a 2019 Sock Lovers Advent Calendar! #slac18 Day 23! The fine folks at @unsimplystitched have done it yet again with this curious colour combination. #sockslife / / Don't forget to take a photo of your daily sock discovery, share it using the hashtag #slac18 and tag us in the photo for a chance to win a 2019 Sock Lovers Advent Calendar! 🎄#slac18 Day 24! On this final day of our 4th annual Sock Lovers Advent Calendar we couldn’t help but have a little fun with, well, snowflakes of course by @mrd_london. Thanks for another great year! (Oh and there’s a little something extra in there for you 😉) #sockslife / / Don't forget to take a photo of your daily sock discovery, share it using the hashtag #slac18 and tag us in the photo for a chance to win a 2019 Sock Lovers Advent Calendar! Don’t miss out on your chance to get the 2019 edition. *Some prices converted to CAD from MSRP. Actual price at purchase may be different and does not consider shipping charges.